Did you know that in the United States, women earn close to 60% of bachelor’s degrees overall, but only 20% of the degrees in computer science, physics, and engineering? 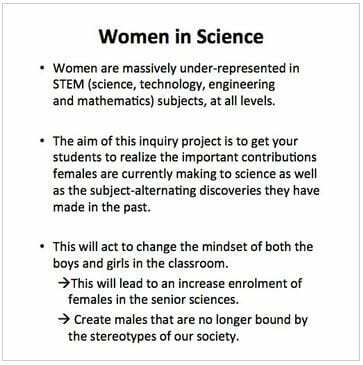 We need girls in STEM (Science, Technology, Engineering and Math) subjects! Once your students have explored the rich history of women in science, they (both the boys and girls) will be inspired to continue on in STEM subjects. 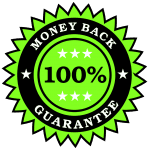 This project is designed in a way that it can be used across all grade levels so whether you are a grade 3 teacher or a senior physics teacher, this project will work well in your classroom. 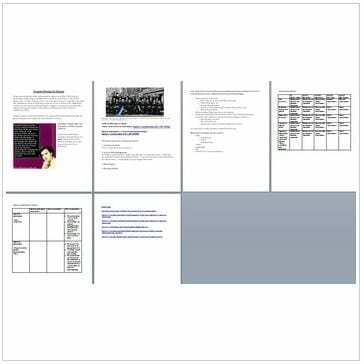 The assignment is in Word and is fully editable. Feel free to change as you see fit. 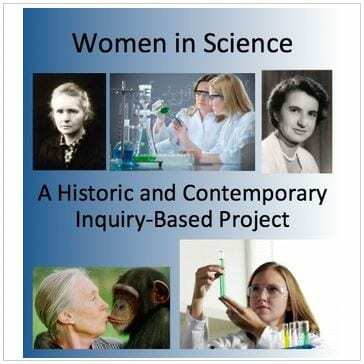 The aim of this inquiry project is to get your students to realize the important contributions females are currently making to science as well as the subject-alternating discoveries they have made in the past. The goal of this assignment is to change the mindset of both the boys and girls in the classroom. – This will hopefully lead to an increase enrollment of females in the senior sciences. – Create males that are no longer bound by the stereotypes of our society. – The assignment begins with profiles of prolific women scientists and inventors. – Next it sets up a discussion about women in science that you will perform in your classroom. – It then moves on to an overview of the task. – The assignment ends with 2 rubrics, 1 is a teacher marking rubric and other other is a peer evaluation rubric. – Some girls need encouragement to enter the typically male dominated sciences (especially the physical sciences). 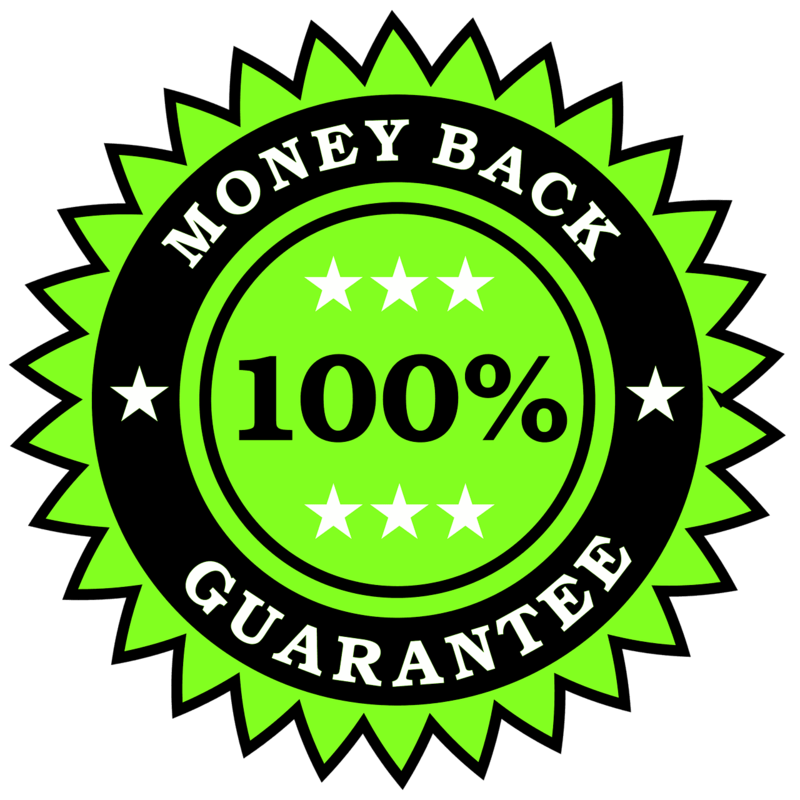 This project will provide them with the confidence to do so. – Some males need to move away from the nasty stereotypes our society has generated over the years. This project will also empower them to change their point of view. 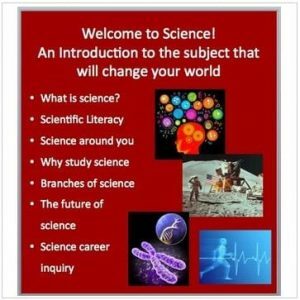 – Lets work together to increase women’s interest in Science. We know they are more than capable, lets give them the encouragement they deserve. What skills will your students learn? – Presentation skills: Students will present their findings in a creative manner. They will need to develop the skills needed to do so effectively.